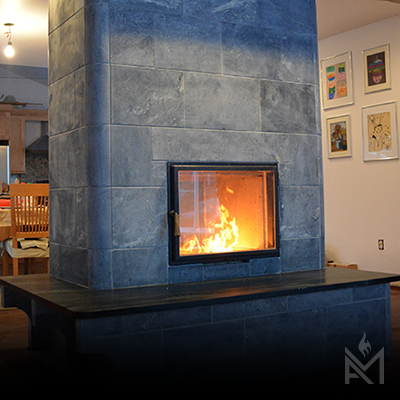 Once you've chosen a masonry heater or wood-fired oven core, it's time to choose a material to wrap it in. Choose the veneer that matches with your home décor. It should fit into your home like a piece of well-curated furniture. The veneer adds more mass to the heater, allowing it to store more heat and release it slowly over many hours. Different types of veneer have different heating characteristics, but generally, the thinner and lighter the veneer, the faster the heater surface will heat and then cool. Our veneer kits are designed and built to the same standards as our heater cores, so you can rest assured you get the best product for your money. Our veneers are DIY friendly and a team of two can assemble one in a day. We offer veneers of finished materials such as soapstone and granite. These materials to serve as a backing for thin veneers such as tile, thin stone, or plaster. Our backing material is the same proprietary refractory used in our cores to provide you with optimal heat storage and transmission at a reasonable cost. Have any questions? Call or email us, we are happy to assist.